Local resident Jake Fair, 14, has always dreamed of writing and starring in his own movie. That dream became a reality this summer with the help of students and alumni from the Newhouse School’s Television-Radio-Film (TRF) department. It all started in May, when TRF Chair Michael Schoonmaker received a call from the Make-A-Wish Foundation of Central New York. Fair, who has cystic fibrosis, had an idea for an action film—his title was “Jewel of a Thousand Suns”—and he needed help. Schoonmaker mentioned the idea to his son Vaughn ’08, a TRF alumnus who had just wrapped up production on a project for MTV. Vaughn made the trip to Fair’s hometown of Chittenango to hammer out the script with Fair and find a crew. 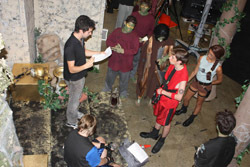 One month later, more than a dozen TRF students and alumni professionals teamed up with area professionals to put together “the movie-making experience of a lifetime,” according to Schoonmaker, complete with elaborate sets, zombie make-up, colorful wardrobe, special effects and action stunts. Newhouse provided studio space, cameras and other production space for the project. “It was so inspiring not only to see our students applying their talents to such a heartfelt cause, but also the way they came together with so many people from the local community,” Schoonmaker says. The crew wrapped up filming in August. The film will premiere with a red carpet event on Saturday, Sept. 11, at 7 p.m. at the Goldstein Auditorium in the Schine Student Center. Free tickets are available at the Schine Student Center Box Office. For more information, contact Schoonmaker at (315) 443-9240.